The Tabard of the Defender is an epic tabard, featuring the uber cool sigil exclusive to the WoW TCG / UDE Points tabards. The design is identical to that of the other epic WoW TCG tabards, but this one is comprised of various shades of gold, yellow and black. It has no item level, so it can be equipped by characters of any level! Tabard of the Defender counts towards the Twenty-Five Tabards achievement. 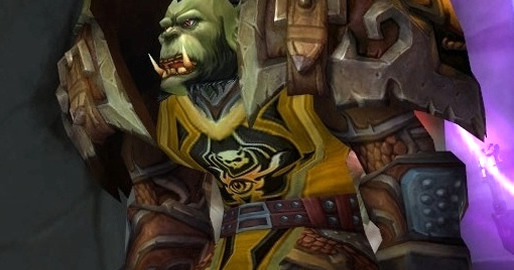 Tabard of the Defender is on the endangered list of unclaimed loot codes, along with all of the other UDE Points Tabards. The UDE Points Program was shut down years ago, so the only tabard codes that still exist are ones which were redeemed during that relatively short time when the program was active, and have not yet been redeemed. The best way to obtain this sweet looking tabard now is to buy an unused loot code from an ebay seller.